"If I could come back as anything--I'd be a bird, first, but definitely the command key is my second choice." i used to dream militant/ dreams of taking/ over america to show/ these white folks how it should be done/ i used to dream radical dreams/ of blowing everyone away with my perceptive powers/ of correct analysis/ i even used to think i'd be the one/ to stop the riot and negotiate the peace/ then i awoke and dug/ that if i dreamed natural/ dreams of being a natural/ woman doing what a woman/ does when she's natural/ i would have a revolution. Eloquence, style, attitude, realness, and honesty are all incorporated in the words of this artist. As a woman she demonstrates and proudly paints her strengths and weaknesses, triumphs and failures, progress and regress. As a poet she “puts it down” in a way that keeps her readers grounded and reminded that she’s human also. Nikki-Rosa (a childhood nickname and title of one of her poems) speaks for women, for poets, for those that struggle, and for those that love hard. Among the names of black female poets you may hear her grouped with the rest: Maya Angelou, Sonia Sanchez, Gwendolyn Brooks, Margaret Walker Alexander, Rita Dove, and NIKKI GIOVANNI. However, the realness captured in this woman’s work is unlike any pain, anger, growth, peace, sexuality, and naturalness placed on paper. Her work defies categorization. Instead of noticing the similarities between her writing style and topics and those of other black female poets of her time period, one can’t help but to also notice the magnetic pull and envelopment that s/he feels towards her work; this is because it reflects those elements within our own lives...and we begin to notice that in this very basic, human sense, Nikki Giovanni is a reflection of us. 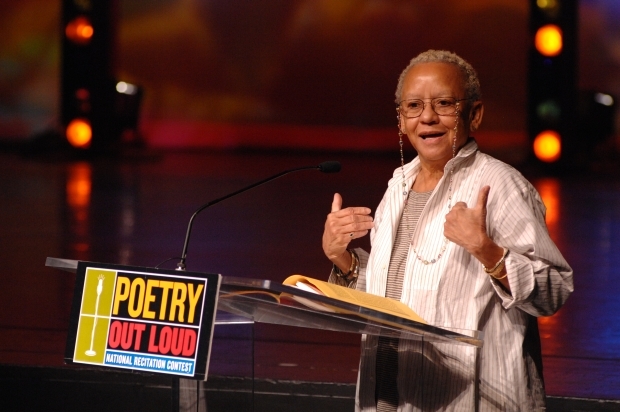 “Nikki” Giovanni was born Yolande Cornelia Giovanni in Knoxville, Tennessee, on June 7, 1943, and raised in the Lincoln Heights area of Cincinnati, Ohio. When she attended Fisk University, she began taking an interest in writing and became active in the Civil Rights Movement. She became extensively involved in the Student Nonviolent Coordinating Committee on campus and the Writers Workshop. The collaboration of literature and politics became her forte in her prime years of becoming a well-known poet. In 1967 she became involved in the Black Arts Movement which was geared towards supporting the struggle for racial equality through the radical artistic expression of black intellectuals. She also organized the first Cincinnati Black Arts Festival. She came to the forefront of literature with her bold, radical, and honest expressions in her books Black Feeling, Black Talk (1968), Black Judgment (1968) and Re: Creation (1970). The anger, pain, and frustration identified with the struggle placed her on the forefront of the movement and in the American literary world. However, as a balanced and healthy individual she realized that change is necessary for growth and then was enabled to be aware of social conditions without being consumed by them. Understanding how and why America is the way that it is, enabled her to demonstrate more wisdom and maturity in her future writings. She grows. It’s evident because she’s a bearer of fruit: poetry. In addition to the Civil Rights Movement, her entrance into motherhood also played a huge role in her life, her writing, and the way she viewed the world. When Thomas Watson Giovanni was born in 1967, she began to change holistically. Spin a Soft Black Song (1971), Ego-Tripping (1973), and Vacation Time (1980) were books of children’s poems. At this time, she began to embrace the human experience… loneliness, thwarted hopes, rejection, and family affection. Around this time she began to speak at various venues, schools, forums, and events earning her more respect, not only as a poet, but a speaker and person as well. Her outspoken persona, raw honesty, and fluency with which she presented and continues to present herself and her viewpoints have earned her the admiration of many. poetry is motion graceful/ as a fawn/ gentle as a teardrop/ strong like the eye/ finding peace in a crowded room/ we poets tend to think/ our words are golden/ though emotion speaks too/ loudly to be defined/ by silence/ sometimes after midnight or just before/ the dawn/ we sit typewriter in hand/ pulling loneliness around us/ forgetting our lovers or children/ who are sleeping/ ignoring the weary wariness/ of our own logic/ to compose a poem/ no one understands it/ it never says "love me" for poets are/ beyond love/ it never says "accept me" for poems seek not/ acceptance but controversy/ it only says "i am" and therefore/ i concede that you are too/ a poem is pure energy/ horizontally contained/ between the mind/ of the poet and the ear of the reader/ if it does not sing discard the ear/ for poetry is song/ if it does not delight discard/ the heart for poetry is joy/ if it does not inform then close/ off the brain for it is dead/ if it cannot heed the insistent message/ that life is precious/ which is all we poets/ wrapped in our loneliness/ are trying to say.